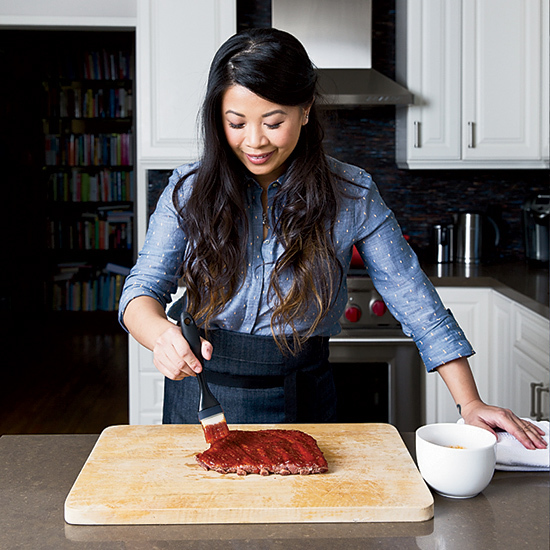 The new Top Chef winner, Mei Lin, talks to judge Hugh Acheson about her perfect 4th of July menu, featuring spareribs and yuzu gimlets. Recently, as Lin scouted locations for a new restaurant, she talked with Acheson about growing up outside of Detroit, her plans to open a congee shack and the food she makes to celebrate July 4th. Hugh Acheson: Let’s talk about your dream restaurant. Mei Lin: I would love to open a congee shack in central or downtown L.A. Congee is a Chinese breakfast dish that’s kind of like oatmeal or a savory rice pudding. I ate a lot of it growing up, and I still eat it weekly. It’s very rustic—that’s actually how I like it, the rustic way. I play around with it as a chef, but at home I don’t want to eat it in any way that’s froufrou, which I know is probably strange. I like my congee with a thousand-year egg, ground pork and scallions, a little soy sauce for seasoning, and that’s about it. I start the congee off with the Holy Chinese Trinity, otherwise known as GGS: ginger, garlic, scallion. HA: Now give me a trick to making great congee at home, ’cause in reality what everyone is waiting for is some of that congee. ML: Congee is probably the easiest dish to cook. The most important thing is to continually stir it so the rice doesn’t stick to the bottom of the pot. Otherwise, it’ll burn and your congee is ruined. HA: Who from this season’s Top Chef would be a great co-chef with you, the Starsky to your Hutch? ML: I think that’s obvious—Melissa King [a private chef in San Francisco]. I’ve done dinners with her in L.A. and San Francisco since the show ended. We have the same mentality and standards when it comes to food and work ethic. For some reason, we have a lot of the same ideas. It’s weird, actually. HA: Let’s talk about your July 4th recipes. How do Asian-style spareribs and kimchi vegetables spell America to you? ML: Especially where I live in L.A., so many cultures influence me and the way I cook: Chinese, Thai, Korean, Mexican. I grew up near Detroit—my parents had a Chinese restaurant—and our Fourth of July barbecues would have spareribs and a ton of different Asian pickles. A Chinese girl in Dearborn, Michigan, eating spareribs and Asian pickles on July 4th—that’s America. HA: How can you give me the peace of mind that making these ribs on July 4th is a better investment of my time than just chowing down on a corn dog? ML: You have to trust. A chef’s job is to know the food, know the farmer. A diner’s job is to know the food, know the chef. That said, I’ll still crush a corn dog every now and then. HA: You make a pretty culturally diverse gimlet. It’s lighter than most gimlets, with the yuzu and the soda. Does that mean I can have a second one? ML: Absolutely! You can have as many as you like—it’s so refreshing in the summer. Yuzu is one of my all-time favorite flavors, so I love to use it in a cocktail. HA: I refuse to ask you the silliest question of all time, which is how it feels to be a woman winning Top Chef, so I will ask you this: How can restaurant kitchens become more progressive, inclusive places? ML: When I open a restaurant, I want people to work fewer days and fewer hours, like four 10-hour shifts in a week. I think chefs should have time to travel, stage and work in different kitchens to see what other chefs are doing. It’s good to broaden your horizons. All those opportunities are the payoff for so much hard work. You learn a lot for yourself and have the chance to teach other cooks. Learning from one another makes for a good kitchen culture.